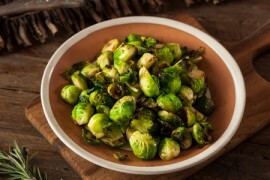 While many of us still adhere to our childhood displeasure at the thought of having to eat Brussel sprouts, there are plenty of delicious ways to enjoy this nutritious, and actually quite good, vegetable. This recipe in particular, for Caramelized Brussel Sprouts with Apples and Pecans, is sure to be a crowd pleaser the second it is displayed on your dinner table! Providing the sweetness of Manuka honey next to the far subtler taste of Brussel sprouts, accentuated even further by apples, pecans, salt and pepper, parsley, etc., this dish will make anyone reevaluate their preferences, or lack thereof, for this perfectly fine source of nutrition. Taking less than an hour to make and requiring few kitchen tools, this is certainly a recipe worth trying. So, let’s get it going! Serves: 4-6. Time: 30 to 45 minutes. Heat a large cast iron skillet with olive oil and butter over medium-high heat. Add Brussels sprouts, season with salt and pepper, and cook until the sprouts just begin to caramelize, which takes about 4-5 minutes. Add apples and toss to combine, and cook until the apples and Brussels sprouts are caramelized and almost tender but still have bite, which will take another 3-4 minutes. Remove from the heat, add the sherry vinegar, pecans, Manuka honey, and parsley. Quickly toss to combine, season with salt and pepper, and remove to a platter. Drizzle with olive oil to finish if one so desires. Quick Tip: To save time, precut your Brussels sprouts and place in a zip-top bag with one or two damp paper towels the day before you before you intend to serve them. Once you are ready to serve, enjoy your Caramelized Brussel Sprouts with Apples and Pecans! Court Rejects Lawsuit, Sets Beekeepers BackDoctor Says Manuka Honey Works for Wound Care?